Life Before the Dinosaurs: Walliserops. Walliserops is a weird genus of lower-to-middle Devonian trilobite with a trident sticking out of its head. There are six species of Walliserops: Walliserops trifurcatus, Walliserops hammii, Walliserops tridens, and three undescribed species. The use for the trident is unknown. Maybe it's for defense, maybe it's for detecting food under the sand (sort of like a built-in radar), or maybe it's for fighting other males to mate and the female doesn't have a trident, so it might be thought to be a different kind of trilobite. This well-preserved fossil of Walliserops trifurcatus shows every detail, so scientists don't need to reconstruct it learn about it. Walliserops had to avoid predators such as Shinderhannes bartelsi, Dunkleosteus, Eusthenodon, and Eusthenopteron. The family of trilobites which was wiped out in the Permian must have been very successful because all other families of trilobites were wiped out in either Ordovician or Devonian. Walliserops isn't the only trilobite with a weird head. The Permian trilobite Keryopigee had a head shaped like a pointy top hat. But Walliserops probably isn't related to Cheiropyge because Cheiropyge only had one spike in the front of its head. Walliserops had a lot more spikes all over the body. 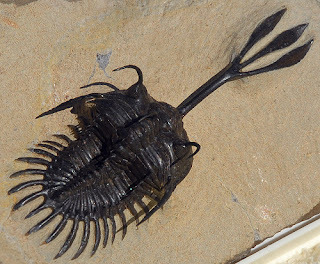 Walliserops trifurcatus was the only species of Walliserops with a long trident. The others had the trident directly attached to the head and not on a pole-like spike like trifurcatus. Is their any speculation at all about it's use? @Emily Thank you so much for that weird creature. It's weird enough to put on my blog, because I usually like to use extremely weird things!!!!!!!!!! @FlavorDav Why do you have that kind of opinion about it? Because the only trilobite which were huge were the arctic trilobites, and I don't believe Walliserops was arctic. @William The latest speculation is that Walliserops had this large trident as horns to fight. It's not an opinion, it's evolutionarily hardwired fear. I'm afraid of anything with more than three legs as it is. I can't help but imagining seeing one of these things scurrying under my refrigerator, is all. Not to mention chasing me across the room. Keep up the good work, ABC! @FlavorDav So you must be scared of tetrapods???????????????????? Actually, it was once thought that Walliserops males had a long trident, while females had a short trident, and that the males used their tridents to flip each other over. With the discovery of a third (and maybe a fourth) form, we're forced to realize that these represent different species, and not genders. I don't think he's saying that you could identify the gender of the Walliserops by its trident. I believe he was trying to say that *if* only males had tridents and those tridents may have been used in fighting for a mate. He also points out that the trident-bearing Walliserops may represent a different species, as you say. Art is very careful to use "maybe" and "possibly," because the answers are not know definitively. He's only seven, so this may not always be clear as you read. "The use for the trident is unknown. Maybe it's for defense, maybe it's for detecting food under the sand (sort of like a built-in radar), or maybe it's for fighting other males to mate and the female doesn't have a trident, so it might be thought to be a different kind of trilobite."